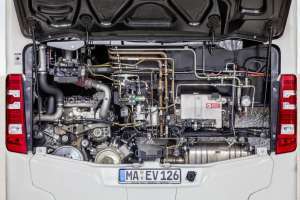 The Mercedes-Benz Bus and Coach unit is really stepping on the gas: the new M 936 G natural-gas engine delivers the same performance as a diesel engine while setting standards with respect to noise and exhaust emissions. The engine is especially compact and lightweight. It is deployed in both the Mercedes-Benz Citaro NGT rigid bus and the Citaro G NGT articulated bus (NGT = Natural Gas Technology). The start of series production is planned for the autumn of 2015. The Mercedes-Benz M 936 G natural-gas engine is based on the advanced 7.7-litre OM 936 turbodiesel engine. This is already in successful use on board the Citaro and Citaro G Euro VI. The vertically installed six-cylinder mono-fuel engine runs on compressed natural gas (CNG). It has an output of 222 kW (302 hp) at 2000 rpm while delivering maximum torque of 1200 Nm consistently from 1200 to 1600 rpm. In some cases, it undercuts the Euro VI emission limits considerably. Such figures, in combination with its impressive power delivery, place the single-stage turbocharged engine on a par with its diesel-powered counterpart. In the main transmission range, performance and torque characteristics remain consistent from idle speed to around 1500 rpm. Above this, the natural-gas engine actually delivers a slight advantage in terms of power and torque. Only from revs exceeding 2000 rpm is the diesel engine superior to the natural-gas one – levels that an urban bus does not reach in real-world scenarios. At the same time, the natural-gas engine from Mercedes-Benz sets new standards in terms of environmental friendliness – its CO2 Life Cycle Assessment improves on that of a diesel engine by more than 20 percent. Using biogas to power the bus makes the CO2 situation even more attractive because driving it becomes almost CO2-neutral. The cylinder block and four-valve cylinder head are the same, having merely been adapted for operation with CNG. Newly developed items are the turbocharger, charge-air ducting, ignition and mixture formation, including cooled exhaust gas recirculation. The ignition system in a natural-gas engine is identical to that in a petrol engine. The M 936 G uses spark plugs with pencil-type ignition coils. They are housed in the same space that originally accommodated the fuel injectors in the diesel engine. The piston crown now has a different geometry. 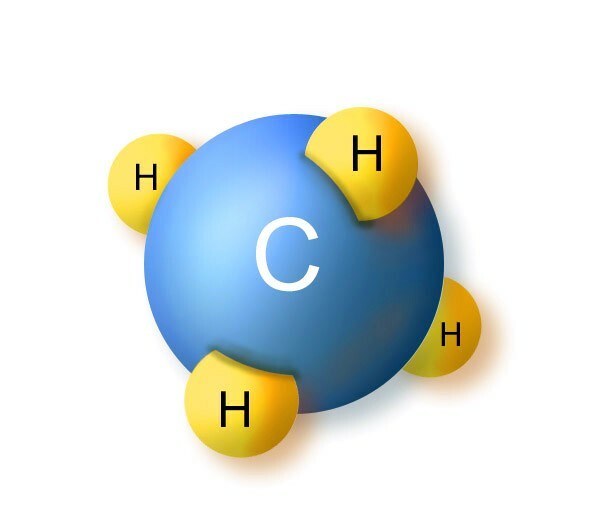 The natural-gas engine operates with a stoichiometric combustion of Lambda = 1, like a modern petrol engine. This results in especially clean combustion allied to high power output and low pollutant emissions. A turbocharger with asymmetrical turbine geometry and two wastegate valves ensures an excellent response from the engine while at the same time supplying the cooled exhaust gas recirculation. SCR technology with AdBlue injection familiar from the diesel engine and the particulate filter are omitted thanks to practically soot-free combustion. As in a petrol engine, emission control for a natural-gas engine is by means of a three-way catalytic converter. The intervals for changing the engine oil and spark plugs have been extended substantially in comparison to the previous engine, from 45,000 km to 60,000 km. Based on the usual mileage for urban buses of approximately 60,000 km per year, this means that the Citaro NGT only has to be taken in for servicing once a year, in keeping with real-world requirements. The natural-gas engine has an even lower noise level than the already smooth-running and quiet OM 936 diesel engine. This is noticeable over the entire engine speed range. This is a very important factor in city centres as well as when negotiating residential areas. A further advantage of the new gas drive system is that the additional weight of the gas bottles has been reduced compared to the predecessor model. A module of eight bottles weighs around 1100 kg. Given the Citaro’s intrinsically lightweight basic design, in their standard versions this allows the Citaro NGT to carry 96 passengers and the articulated Citaro NGT bus 153. The M 936 G is presently the most compact natural-gas engine in its class. Due to the basic dimensions being identical to the Mercedes-Benz OM 936 engine, the packaging at the rear of the Citaro is largely the same. With a displacement of 7.7 litres (M 447 hLAG predecessor: 12.0 litres), the engine’s design alone lowers the weight by some 15 percent or 150 kg. New gas bottles also play a considerable role in lessening the additional weight. They are lightweight versions made of a composite material with a plastic core and a carbon and glass-fibre sleeve. Depending on the vehicle and deployment scenario, the Citaro and Citaro G make use of between four and eight gas bottles. These are housed on the roof of the buses under a cover panel. For the sake of weight distribution, they are located over the front axle on a rigid vehicle and over the centre axle on an articulated bus. Power transmission is handled in the usual way by automatic transmissions with torque converter from ZF and Voith. The shift points and use of the converter have been specially adjusted to suit the new gas engine’s characteristics. The European market for urban buses with a natural-gas drive system presently comprises just under 1000 units per year. Mercedes-Benz expects this number to increase further in future based on discussions about the environmental burden in built-up areas or conserving resources. The very fact that the Mercedes-Benz Citaro is available with an advanced natural-gas engine is also expected to stimulate demand.Use of the new Mercedes-Benz M 936 G natural-gas engine in urban buses is by no means restricted to Europe or to the Citaro. There is increasingly talk of using natural-gas engines in North and South America as well as Asia.